As stated in the previous section business-related procedures represent a real business workflow in your application. 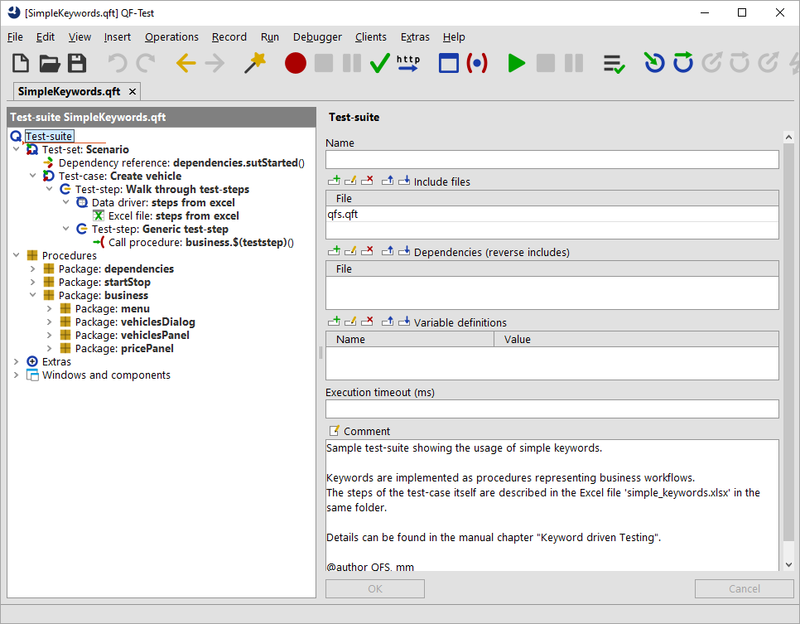 You can find a sample at qftest-4.5.2/demo/keywords/simple_business/ SimpleKeywords.qft. The respective test-plan can be found at qftest-4.5.2/demo/keywords/simple_business/ simple_keywords.xlsx. Please take care to copy the demo folder to a project-related folder first and modify them there. As QF-Test can read excel files row by row, we have decided to go for that excel structure. Reading that file follows the data-driven concept (see section 38.4). It's also possible to use another structure of the excel file, but then we lose the advantage of using the QF-Test functionality directly without any scripts or if-conditions. In the first row we find the values teststep, value1 and value2. That row will be interpreted as variable names by QF-Test. Every subsequent row will then contain respective values for those variables. This mechanism allows QF-Test to walk through that Excel file in order to execute the planned test-steps. Test-set "Scenario" Represents the container node for the test-execution. This node could be omitted theoretically. 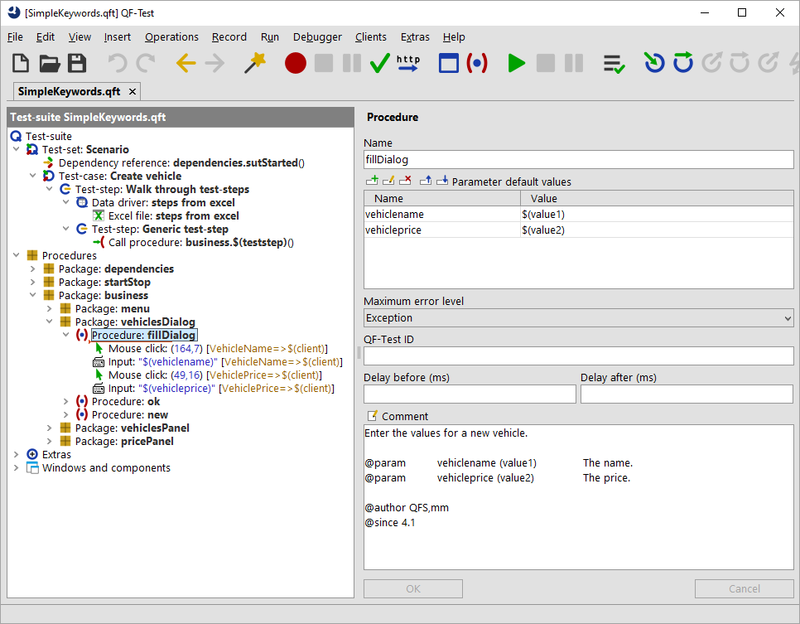 Test-case "Create vehicle" This node represents the implemented test-case. Teststep "Walk through test-steps" This node is required to read the excel file with a data-driver node. Data-driver "steps from excel" A data-driver reads the content of the Excel file row by row. Excel file "steps from excel" Points to the Excel file. Call procedure "business.$(teststep)" Here the respective procedure defined in Excel is called. The variable teststep will be filled with the planned data of Excel because of the data driver mechanism. All required procedures are implemented in the package business. In order to allow a simple variable definition any steps in Excel use the variables value1 and value2. Every procedure maps those generic names to the specific parameters of the procedure itself. This concept requires that any used keyword has to be implemented in QF-Test already before using it. If your steps require more than two parameters you need to extend the excel file with more columns. In addition you need one test-case node in QF-Test per test-case in Excel. You can make this more flexible, see section 25.5.